And I wonder when I sing along with you if everything could ever feel this real forever. Looking for something to help me burn out bright. I'm looking for a complication. Looking cause I'm tired of lying. Foo Fighters are an American rock band, formed in Seattle in 1994. It was founded by Nirvana drummer Dave Grohl as a one-man project following the death of Kurt Cobain and the resulting dissolution of his previous band. 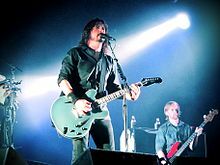 The group got its name from the UFOs and various aerial phenomena that were reported by Allied aircraft pilots in World War II, which were known collectively as foo fighters. All songs written and composed by Dave Grohl. They'll come back and knock you down and I'll be free. I've taken all and I've endured. But it's you I fell into. All songs written and composed by Dave Grohl, Nate Mendel and Pat Smear, except where noted. I'd rather leave than suffer this. I'll never be your monkey wrench. Under pressure wind up snapping in the end. Too alarming now, to talk about. Take your pictures down, and shake it out. Use that evidence, race it around. Come down and waste away with me, down with me. Everlong, written by Dave Grohl. I'm on your back, I'm on your back, I'm on your back. Walking After You, written by Dave Grohl. All songs written and composed by Dave Grohl, Nate Mendel and Taylor Hawkins. Oh mirror mirror, you're coming in clear. I'm finally somewhere in between. I never meant to make a big scene. Will you resign to the latest design? You look so messy when you dress up in dreams. You make me dizzy running circles in my head. One of these days I'll chase you down. Well look who's going crazy now. We're face to face my friend. Wish I could stay sick with you. But there's too many egos left to bruise. Eating deep inside of you. And you dream about yourself. And you bleed and breathe the air. And it's on and on and on and on. I'm in the sky tonight. There I can keep by your side. I'll be coming home next year. Climbing our wings will burn white. All songs written and composed by Dave Grohl, Taylor Hawkins, Nate Mendel and Chris Shiflett. All my life I've been searching for something. Something never comes, never leads to nothing. When it comes around and it's taken away. Searching all these days to find the end. You're everything, you're everything I'm not. But I'm anything, I'm anyone you want. It's times like these you learn to live again. It's times like these you give and give again. It's times like these you learn to love again. It's times like these time and time again. There is no way back from here. My heart is under arrest again. Dancing with the bones of my buried past. Never mind there's nothing I can do. Bet your life there's something killing you. A little bit of resolve is what I need now. Pin me down, show me how. The wheel is spinning me. The colors change in the valley skies. No dead end in sight. But all along it never meant a thing. All songs written and composed by Dave Grohl, Taylor Hawkins, Nate Mendel, Chris Shiflett and Pat Smear. Why won't you let me disobey? It's getting kinda late but I don't wanna wait no more. Well may I have this dance of day? Passed your test of faith. How did this come over me, I thought I was above it all? Our hopes gone up in smoke, swallow your crown. Ain't that the way it always starts? I flipped you station to station. One of these days their bombs will drop and silence everything. Every time that I return. This page was last edited on 30 July 2018, at 22:46.